Ina Jaffe Ina Jaffe is a National Desk correspondent based at NPR West, NPR's production center in Culver City, California. June 29, 2010  Tea Party favorite Sharron Angle is challenging Senate Majority Leader Harry Reid in Nevada. So far, she has generally avoided the mainstream media. But on Tuesday, she will answer questions from veteran Nevada political journalist Jon Ralston on his TV program Face to Face. June 28, 2010  Carly Fiorina argues that what sets her apart from incumbent Barbara Boxer is her range of life experience -- from law-school dropout to first female CEO of a Fortune 20 company. But critics say Fiorina neglects to mention that she was fired from Hewlett-Packard. June 11, 2010  Medical marijuana is legal in 14 states, and advocates would like to expand that or legalize pot altogether. But the judges, lawyers and therapists who work in drug courts say changing attitudes make it harder to convince people that marijuana is a problem. June 1, 2010  Senate Majority Leader Harry Reid is back in Nevada this week campaigning for re-election. Democrats are worried they could lose that seat. Reid has poll numbers as weak as any incumbent in the country. May 25, 2010  President Obama travels to California on Tuesday to raise money for Democratic Sen. Barbara Boxer. Her unabashed liberalism has marked her as a senator Republicans love to hate. And with voters' anti-incumbent mood, three potential Republican challengers think this is the year they can beat her. 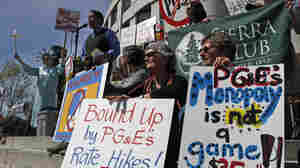 Corporate Bucks Behind 'Citizens' Initiatives In Calif.
May 24, 2010  California voters have used ballot initiatives to rewrite the laws on everything from taxes to medical marijuana. But increasingly, large corporations are behind the initiatives. The state's largest for-profit electric company and a major auto insurer have poured millions into questions on the ballot this June. May 3, 2010  The California governor cited the massive oil spill in the Gulf of Mexico as the reason for his about-face. The state had hoped to use $100 million from a deal with a Houston-based energy company to plug the budget deficit. April 29, 2010  The company cited errors in its previous calculations that led it to announce an increase in health insurance premiums by as much as 39 percent for some California customers. The potential increases became a major talking point for supporters of the health care overhaul. Thousands Line Up For Free Health Care In L.A.
April 28, 2010  Thousands of people are lining up for free medical and dental care outside a Los Angeles sports arena this week, at a time when the city's fiscal outlook is bleak, and the regional unemployment rate is the highest in decades. 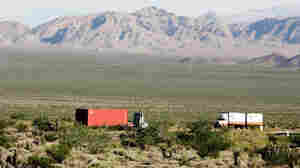 April 23, 2010  The Mojave is home to mountain ranges, endangered wildlife and pictographs. Sen. Dianne Feinstein (D-CA) has proposed a national monument to keep some desert lands off-limits to energy development. But solar developers say there's room for both conservation and renewable energy. April 17, 2010  For nearly a century, voters in California have expressed their displeasure toward the government by means of the initiative and the recall. But some say that has only made it harder for elected officials to do their jobs and gain the voters' trust. 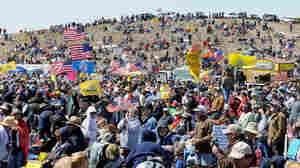 'Tea Party Express' Picks Up Steam On Way To D.C.
March 29, 2010  About 8,000 people gathered near Senate Majority Leader Harry Reid's hometown over the weekend to protest the health care overhaul that Reid helped push through Congress. The rally in Searchlight, Nev., kicked off the Tea Party Express, a cross-country caravan targeting Democrats who voted in favor of the new law. March 28, 2010  The Tea Party has kicked off another national bus tour, this time near Searchlight, Nev., home of Senate Majority Leader Harry Reid. He faces a tough re-election bid, and those at the rally wanted to send a message: They will work to defeat Reid and the policies supported by his party. March 15, 2010  Republicans hope to reduce the Democratic majority in the Senate in November, and one of their targets is California's famously liberal Barbara Boxer. She is a three-term incumbent whose job approval has dipped below 50 percent. California Republicans heard from their leading contenders for the U.S. Senate over the weekend, all claiming to have the best chance to beat Boxer. March 14, 2010  California Gov. Arnold Schwarzenegger skipped his state's Republican convention this weekend in Silicon Valley. But two candidates hoping to succeed him were there and working hard to win over conservative activists.